Kingfisher windows can offer its customers throughout Sheffield a full range of double glazing products. From uPVC casement windows and composite doors, through to conservatories and orangeries, we’re able to act as a one-stop-shop solution for all your home improvement needs – no matter how complex. To make sure our customers benefit from double glazing of the highest quality, we use the best manufacturers and fabricators. This means you’ll be investing in products that have been engineered to last. Whatever the scale of your project, you’ll be able to depend on Kingfisher to deliver an impactful solution. Add a sense of presence and space to any room when you choose uPVC bow or bay windows from our double glazing range. Whichever design you prefer, it will stand out in relief form from your Sheffield home and create a great first impression when people come to visit. Alternatively, you might prefer the look and design of our uPVC sliding sash windows. Ideal for older properties, this is double glazing that effortlessly communicates charm. This style of window is opened vertically from the bottom and will intrude less into your home. Our Georgian uPVC windows are available in two different double glazing designs. The Optima Chamfered is sleek and modern in design, while the Optima Sculptered communicates a classic aesthetic suitable for older properties. If you want to make an entrance, ask about our composite door range. This is double glazing with a difference, as evidenced by the sheer strength of this product, which combines multiple materials to ensure longevity. Introduce your garden in Sheffield in style with our uPVC patio doors. Fluid vertical movement is precipitated by a rail system, while the wide expanse of glass maximises light entry. This double glazing is both practical and beautiful. Our Masterdor range of doors can include two slabs to increase the profiles’ thickness. You’ll also be able to select from a range of fire resistant doors, which means your double glazing will protect you if the unexpected happens. Kingfisher Windows offers a stunning range of conservatories and orangeries. Not sure what the difference is? A conservatory uses more double glazing and is normally characterised by a dwarf wall that runs around its edge. An orangery features more masonry and often incorporates brick piers or columns into its design, while light is provided from a lantern roof. Whatever choice you make, your home in Sheffield will benefit from more space. A conservatory or orangery can, if carefully thought through, work just as well as a dining room, lounge or study. Selecting the right double glazing will be important, because you’ll want your room to be the perfect temperature. We’ll be able to guide you in every aspect of the design. 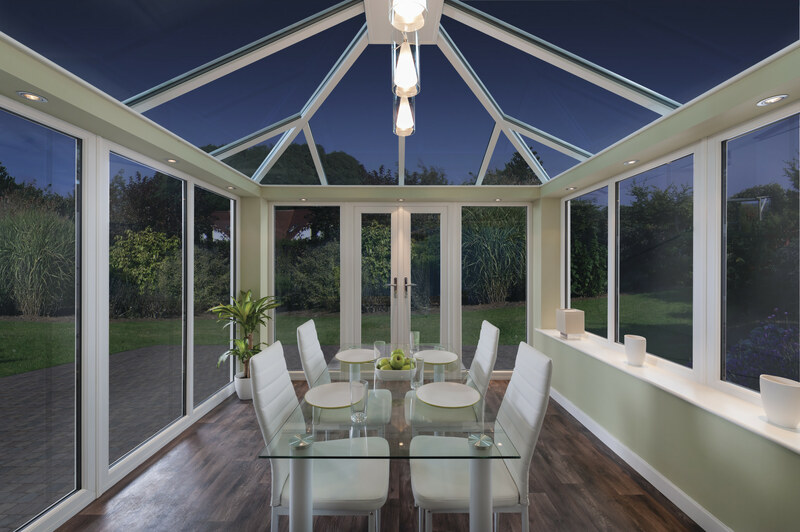 As part of your double glazing research, you’ll no doubt want to explore the benefits of conservatory roofs. We can offer two types of system, both of which will add measurable value to your Sheffield home. Glass conservatory roofs let in lots of light, which will add a sense of space to your room below and connect it to other rooms in your Sheffield home. Our products are weatherproof and extremely thermally efficient. A tiled conservatory roof may suit your design objectives better, as it provides more privacy -while expertly retaining heat and offering long-lasting value. Contact us for more information and a double glazing quote. The double glazed units used in the designs of our tiled and glass conservatory roofs will prevent condensation, optimise light penetration, and turn your brand-new room into a fully habitable space you can enjoy. Whether you need new windows, doors, an orangery or a conservatory roof, Kingfisher Windows’ friendly and experienced team will be able to help you find the right double glazing products. The double glazing we install in your Sheffield home will come with a 10-year insurance backed guarantee for your peace of mind – so you won’t need to worry if the unexpected happens. Kingfisher Windows belongs to a range of industry schemes, including FENSA and The Federation of Master Builders. This means you can have confidence in the quality of our work and service. Contact us today for a free double glazing quote for your Sheffield home. You can call us on 0113 2854985 or send us a message. Use our free design tool if you just want guideline prices at this stage.